How to Convert Video to HTC One M9 - Play AVCHD 4K Videos on HTC One M9? 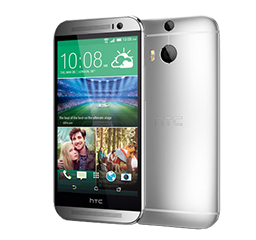 Why convert video to HTC One M9? Because every bean has its black, so does M9. From its official specifications, it's easy to draw that HTC One M9 can play some common videos like MP4, 3GP, WMV and even MKV, but not MTS, M2TS, AVCHD, and the newly emerging H.265/HEVC encoded ones. Here a must-have video converter tool for HTC One M9 is recommended to all M9 possessors for converting video to HTC One M9 with a few mouse clicks. Support converting more than one videos, and merging the converted videos into a single one. 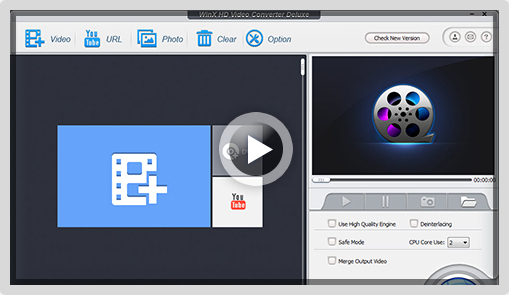 Support converting more than one videos, and merging their output into a single one. Click "+ Video" button on the top toolbar to load or directly drag one or more source videos HTC One M9 not supporting but you wanna play on M9 to the software. B. Choose one video at "PC General Video" category according to the HTC M9 supported media formats. Click "Browse" button to select the path of destination folder for saving converted video for HTC One M9, and then confirm it. 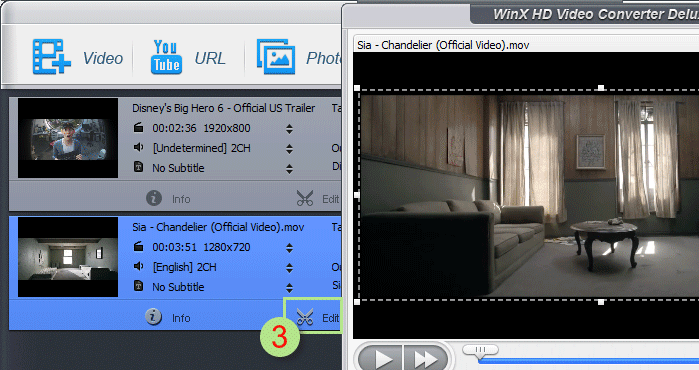 Since WinX HD Video Converter Deluxe supports choosing expendable USB storage, you can also connect M9 to computer with USB cable and select M9's ROM or MicroSD card storage as the destination folder, which helps to saving time of copying & pasting. As long as you are expert at video audio parameters adjusting, you can change the default date manually by clicking "setting" icon to open up parameters window, where video/audio bit rate, video frame rate/resolution/aspect ratio and audio channel/sample rate can all be reset. After checking the options you need under preview window, eg. "Merge Output Video", just press the blue "RUN" button to set out converting video to HTC One M9 with no difficulty. You can stop the process in conversion dialog box and check two whether to "Shut down computer when conversion completed" or "Open output folder when conversion completed". WinX HD Video Converter Deluxe enables you directly to convert video to HTC One M9/M8 accepted files with advanced video editing and setting features, also video to HTC Pad, Samsung Galaxy Note, Google Nexus, Huawei Ascend, Amazon Fire, Fujitsu and any other Android tablets and mobiles, transferring and playing SD/HD/4K on iPhone iPad, Windows Phone, Sony PS4/PSP, Microsoft Xbox and so on. It can also act as slideshow maker, and YouTube video downloader. iPhone 7 vs HTC 10 [Full Comparison] on Specs, Look, Price etc.